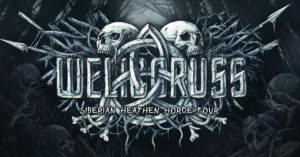 WELICORUSS delivers dark, intense and mystic sound that demonstrates how to impressively unite the contemporary metal with the dim and distant ethereal. Their music recreates the icy cold atmosphere, expressing both natural feelings and personal perception of the Ancient Philosophies through their lyrics. Welicoruss reflects in their compositions their admiration of Nature and search for the hidden mysteries of the secret Powers that rule the Universe.